Thos order selection is for five(5) Armadillo Dollar(R) Original singles, each one is 7 1/8″ wide by 2 7/8″ high and fits into most bi-fold and tri-fold wallets. We have maximized the surface area of the Armadillo Dollar to protect you, so the surface area is about 25% larger than a standard US Dollar bill. When you fold your wallet, the rfid protection is in its most protective form. 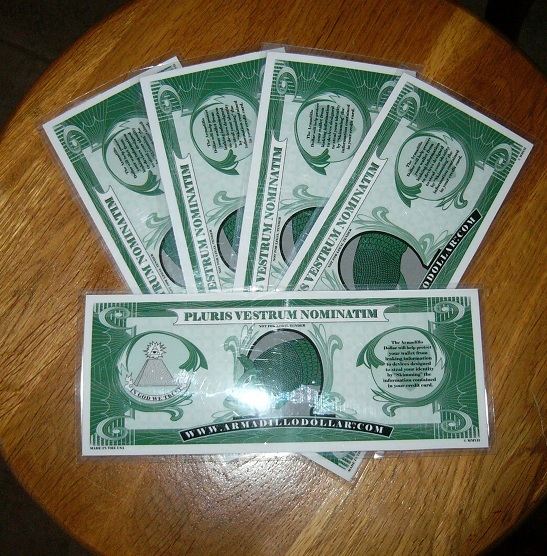 Get a 5 pack of rfid shields – Armadillo Dollar Originals for your family and friends. Each comes in a separate envelope with instructions for use. This is the Original version, and it works great! Protect Your Identity! Shield Your Money! Guard Your Family!! This five pack for $59.80 includes Free Shipping.